Welcome to the second showing. Everyone up toplaying today? What better way to enter your weekend, then with good karma, and a smile in your heart. So, for those of you stopping by for the first time, today is the day I inspire you to do 3 beautiful acts of random kindness, to three unsuspecting people. 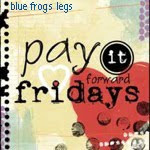 After, recently re-watching the Pay it Forward, Warner Bros. Movie (2000), I was inspired to make my Fridays; Pay it Forward, Fridays. There is also a whole Pay it Forward Movement (http://www.payitforwardmovement.org), and a Foundation to go along with it. Go check them out! 2. Gave away my freshly bought popsicle, to someone who needed it more than I did! ** Received random act of kindness by coming home the other day to 2 beautifully filled flower pots on my porch J. Beautiful idea. Glad you posted this. I will go forth and pay it forward! Love your logo and name of the blog! Your little girl is awesome...especially copying her mom. I think this a wonderful idea....missed your post this week, but I see you were graduating...congrats! Great way to Pay it Forward. I sure hope you keep up with this every Friday... as I would love to participate in this as well. You should create a button for the next post so that more people can link to get this started... it's a great idea! Great blog... I am now following and definatly looking forward to reading more of your work. Being a HUGE fan of this movement, WHAT IT MEANS, and, not to mentione the MOVIE, I absolutely LOVED this posting!! Kimberly, finally finished my Pay it Forward button...feel free to grab it and spread the word...Pam thank you so much for your words, I would love to be the push of our little movement !!! I love the Pay It Forward opportunity you give to all of us and will be sure to use my Fridays to consciously be kind and pay it forward. I have added your button to my blog as a reminder. I love your blog & will spend spend more time catching up. This is my first visit. Blessings.